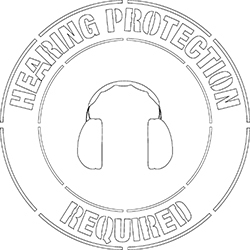 Using a stencil that says, “Hearing Protection Required” is a simple way to make sure everyone entering a given area knows that they need to wear proper hearing protection. Protecting your employee’s ears is very important because it can lead to hearing loss much more quickly than would otherwise be possible. This simple stencil allows you to quickly apply paint to any flooring so that the reminder is easily visible in any area. There are many things a facility can do to help improve safety and this type of visual communication strategy is one of the best. It is easy to implement, inexpensive and very effective. When it comes to protecting the hearing of your employees there are few things that will provide you with a better return on investment. Another great thing about this stencil is that it can be used many times so you don’t have to buy a new one every time you want a new floor marking put in place.